No matter the time of day, my appetite, my clothing, or my food preference, L'Atelier always seemed like the right place to go, and I think that's a really important quality of a favorite restaurant. Considering the amount of times we've eaten here, it would not be an exaggeration to say that Aaron and I have tried everything on the Fall 2006, Winter 2006, Spring 2007, and Summer 2007 menus, and even some of executive chef Yosuke Suga's experimental dishes. Maybe this is why L'Atelier is perhaps our favorite restaurant in Manhattan. L'Atelier's location inside the Four Seasons Hotel might suggest a level of stuffiness, but this is quickly eliminated by Joël Robuchon's unique sushi-bar style seating, which forces complete strangers to talk with, rather than about, each other. This setup also means that the final platings are done directly in front of diners, allowing them to have an increased appreciation of the work that goes into each course, while cleverly hiding the messier kitchen elements behind closed doors. The energy from the adjacent Four Seasons cocktail lounge also flows into the restaurant, setting a lively tone without airs, something that is very much appreciated in contrast to many other haute French restaurants where the only sound is that of cutlery hitting the plate. 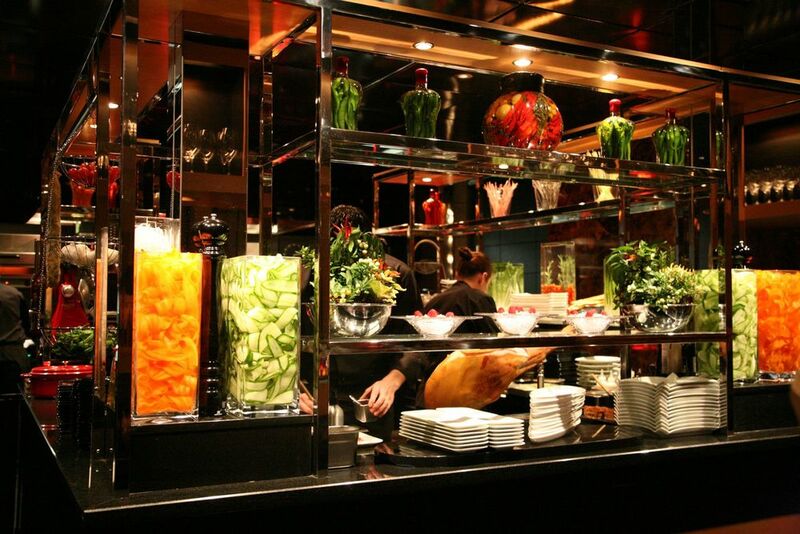 Instead of chandeliers, oil paintings, and exquisite gold-leaf molding, L'Atelier's decoration comes from the food itself, with vases of vibrant orange carrots and green cucumbers sliced daily and put on display. The restaurant uses pervading black undertones to place further emphasis on these vivid colors: the placemats, plates, and countertops all keep one's focus solely on the food. Even the staff is dressed in black uniforms. Against this black canvas, the halogen spotlights ensure that every detail of every course is highlighted. 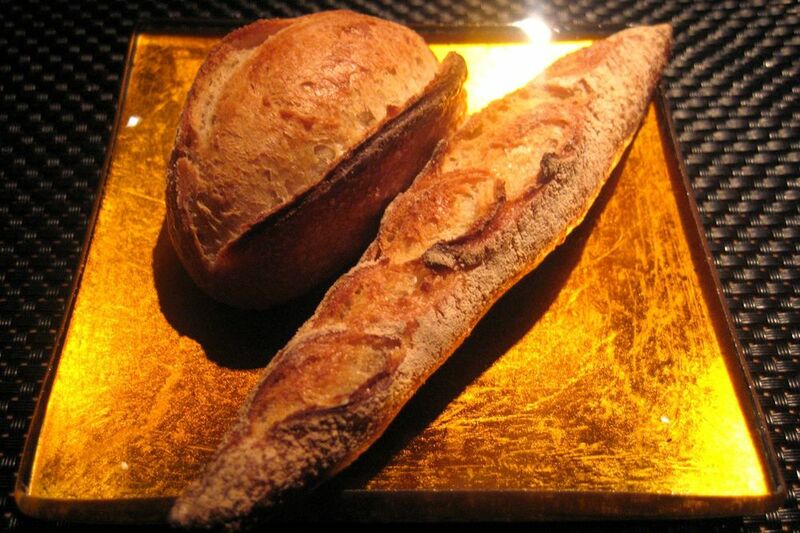 Each meal at L'Atelier begins with a basket of miniature baguettes and rolls. The bread is made with a high-gluten flour which creates a slightly elastic interior; the perfect texture, in fact, for returning soup bowls in spotless condition. The crumb is not dense, and the crust is light and crispy -- the product of allowing a small amount of dough to naturally expand to size. Be warned, though -- it's very easy to fill up on these rolls, and while delicious, they are just the beginning. The amuse bouche remained fairly consistent through our visits to L'Atelier, a foie gras parfait with port reduction and parmesan foam. The saltiness of the parmesan contrasted with the sweet port reduction, and both flavors complemented the warm, silky-smooth foie gras mousse. A very rich, and very welcomed, introduction. I once read that the number of pleats in a chef's toque represent the number of ways a good chef can cook an egg. If that's the case, someone deserves a huge crease for L'Oeuf de Poule, a stunning dish that we tasted the first night at L'Atelier. A chicken egg was first slow-poached, then flash-fried inside a golden nest of crispy strips of brik pastry. Surrounded by crème fraîche and tiny bits of smoked salmon, then lavishly topped with a mound of Osetra caviar, this presentation was nothing short of spectacular. I am always in awe of the egg, a self-contained nutritionally perfect ingredient that serves as the foundation for an infinite number of recipes. 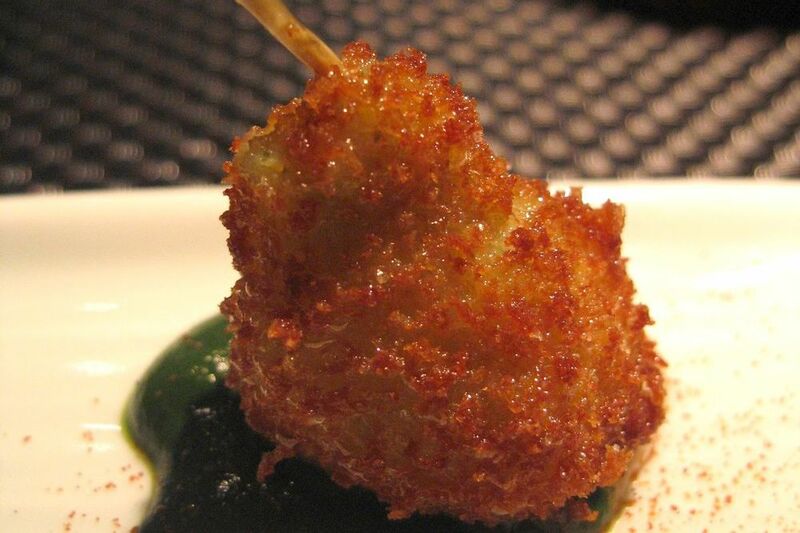 With this dish, Robuchon pays homage to this divine ingredient, luxuriously salting it with caviar and diversifying its texture by adding crispy bits of fried batter. Aside from the absolutely beautiful presentation, the well-rounded flavor was both fundamentally satisfying and intellectually stimulating. The incredibly generous portion of caviar ensured its distribution lasted through each bite, which was delicious even after the egg was already just a happy memory. With an astonishing $98 price tag a la carte, both the cost and the flavor of this dish are over the top. Having at least one egg dish in every meal at L'Atelier always seemed like the right thing to do. And with the familiar comfort of eggs and toast in the morning, L'Oeuf coque sans coque was a great example of why. The preparation could not have been simpler. A soft poached egg placed atop a spicy eggplant stew redolent of cumin. Surrounding bits of crispy croûtons and a thin triangle of toasted bread lent a nice crunch that contrasted the oozing egg yolk. A light buttery foam on top of the egg added yet another texture, bringing a light airiness that the dish would have otherwise lacked. I would be happy to wake up to this any day. Another tribute to the egg is L'Oeuf cocette, a soft-boiled egg topped with a lightly foamed mushroom cream, vibrant green parsley puree, and a few sautéed chanterelles. There's something inherently homey and satisfying about eggs, remarkably even when served in a martini glass in the Four Seasons Hotel. The first dip of one's spoon into the glass sends the rich yellow yolk oozing throughout the rest of the ingredients. The mushroom cream added earthiness without weight and the beautiful green parsley puree added necessary brightness with both its color and its herbal flavor. A simple piece of grilled bread, perhaps, to dip into this rich concoction would have been added a nice touch. Next one might want to move on to some soup, and if it's warm out, there are few more refreshing options than La Tomate en gazpacho aux petits crôutons dorés et amandes fraîches, L'Atelier's take on the Spanish classic. A small bowl of chilled tomato soup, resting on a bed of ice, and studded with fresh almonds and miniature croûtons. This soup was a bit Frenchified, perhaps, as it was a bit creamier than your typical gazpacho. Yet that textural change made the soup more interesting, I thought. There were also streaks of aged balsamic which added a little bit of tartness to a few special bites. Aaron was not quite so taken with this dish, but I found it to be a winner. If it's cold out, the options are even better. 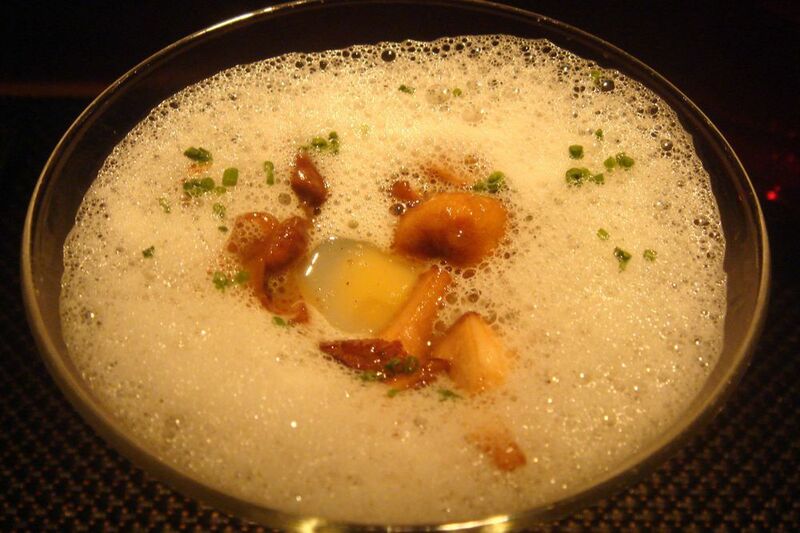 The late autumn menu brought La Châtaigne, a chestnut velouté with celery foam and foie gras. This is my single favorite dish from L'Atelier (and, apparently, Aaron's). It's also the single most delicious dish I've ever had in the US. 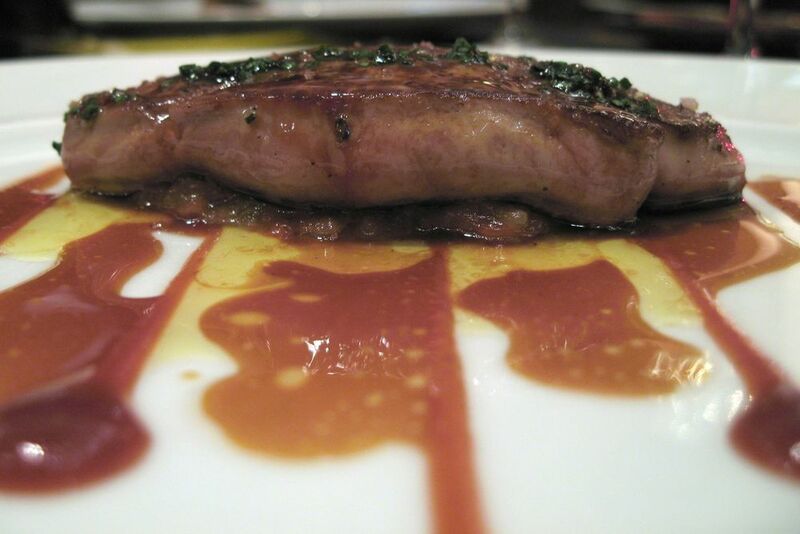 Chestnut and foie gras: what a brilliant combination. The warmth of the nutty velouté with the creamy foie gras was nothing short of enlightening. 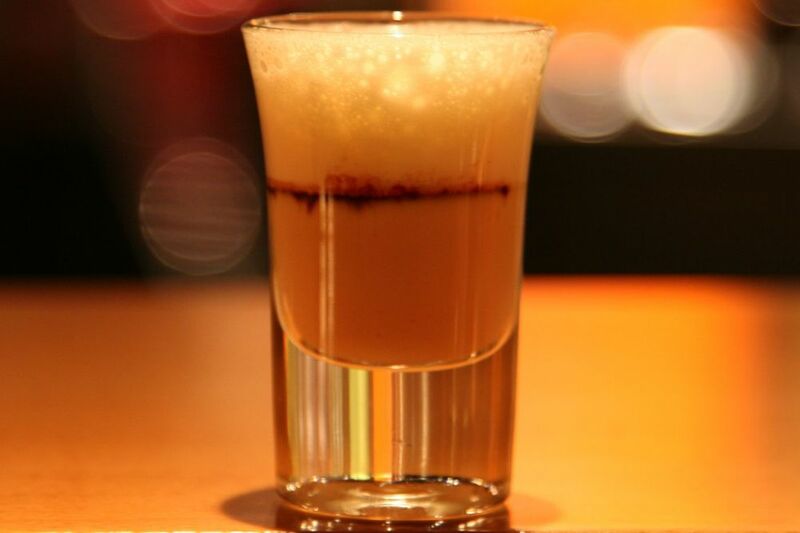 The addition of celery foam added a textural element that bridged the gap between liquid and solid; and even more importantly, brought a hint of vegetal bitterness to tame the sweetness of the chestnut. The ratio of foie to velouté was immaculate, ensuring that each bite had some of each. In every regard, a truly stunning dish. Le Potiron en velouté au lard fumé et croûtons dorées was another fabulous soup blending the warmth of autumn in the form of pumpkin, with the everlasting satisfaction of smoked bacon. A beautiful study in contrast, just thinking about this dish makes me hungry. Each element contributed its unique texture to this complex soup, keeping it from ever becoming monotonous. Every bite had a different blend of crunchy, creamy, and smooth with the croûtons, crème fraîche, and velvety pumpkin broth. The smokiness of the bacon both complemented and tamed the sweetness of the pumpkin. Some croûtons remained crunchy while those toward the bottom softened up. There was no need, even, to submerge bread in this soup. At least, not until the very end, when I sent my bowl back sparkling white. There were times I wasn't quite sure if soup or pasta might make a more fitting early course. In such instances, I went for Les Ravioles, which offered the best of both worlds. 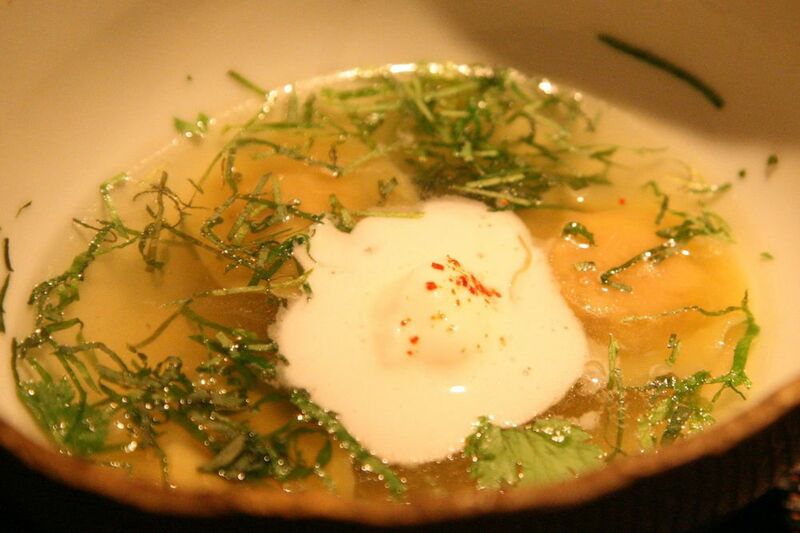 A captivating preparation, withtiny foie gras ravioli floating in a warm, rich chicken broth with spiced crème fraîche. Somehow, each bite managed to consist of both pasta and bouillon, making this very enjoyable to the very last spoonful. The texture of the ravioli was also very interesting, as there was a delightful popping sensation in my mouth with each bite. These satisfyingly intense bursts of flavor were not unlike eating larger fish roe, only instead of that salty brine you got the unmistakable fatty goodness of foie gras. The dollop of crème fraîche made some spoonfuls of the broth slightly richer, and its cool temperature added a very pleasing contrast to the warm soup while adding a bright top-note of flavor. Seeing its beautiful plating going on at the bar, it was impossible not to want to try Le Caviar Osciètre, a generous spoonful of Osetra caviar atop a roll of capellini very lightly dressed with tomato sauce. Pretty to look at, no doubt, but this is a dish that ultimately left both Aaron and I unfulfilled. I think the biggest problem in this dish was the lack of textural contrast -- the tender capellini (generally unworthy of being called "pasta" anyway, according to Aaron) and moist caviar proved to be a monotonous combination. And as for flavor, the capellini didn't have much at all, with its tomato dressing too bland to be lifted even by the briny caviar. Disappointed with that pasta dish, Aaron thought Les Spaghettis might do the trick instead.L'Atelier's rendition of spaghetti alla carbonara was something he had read about as an off-the-menu specialty from the Paris location. The dish was served traditionally: just pancetta, egg, black pepper, parmigiano-reggiano cheese, and spaghetti. The small cubes of pancetta were rendered just until translucent without being overly crispy -- exactly the right point. The rich yellow-orange color was evidence that only egg yolks we stirred in at the last moment. In the hands of lesser cooks, this sometimes leads to small coagulated bits of egg rather than a creamy sauce, but that was not the case here. Aaron found this dish to be over-priced, at $40 for the two small half-portions. But other than that, his only knock against the dish was that there only a smattering of black pepper, an essential ingredient in this Italian classic. Instead of such rich beginnings, sometimes I just wanted to start a meal with something cool, clean, and light. Perhaps even something raw. In such instances, Le Thon Rouge is a nice choice. A simple plate of lean tuna sashimi garnished with sun-dried tomato oil and a light sprinkle of fleur de sel. It's hard to critique this dish since its primary ingredients are so simple and so good, and I'm always impressed by the humility of a chef who can take a step back and let nature sing on its own (*cough* Kinch). This tuna was impeccably fresh, and the coarse fleur de sel added a nice crunch with each tender piece of fish. The tomato oil added richness and a complex sweetness, rounding out the cool, salty combination of tuna and fleur de sel. We saw this dish many several times during the course of our visits, most often as a complimentary treat from the kitchen. But I probably wouldn't specifically order this dish again. Not because it wasn't delicious (it was); but because I think there are more interesting dishes to sample, and stomach space is finite (or so people tell me). Besides, if all I'm after is fresh raw fish, there are plenty of delicious Japanese restaurants in New York. Another cool appetizer was the surprisingly lackluster Le Homard, paper-thin turnip slices encasing chunks of lobster meat bound together with a sweet-and-sour emulsion and a bit of rosemary. These lobster "ravioli" were often presented as a trio, but the single one seen below was sent out as a "gift from the chef" one evening. Surrounded by cracked pink peppercorn, the aroma became almost floral, complementing but not contrasting the natural sweetness of the lobster meat and the turnip. In the end, though, this combination was perhaps a bit too sweet. I guess it turns out that even haute versions of lobster salad are not much more appealing to me than traditional ones. A similar presentation with equally unsuccessful results was Le Crabe. A very light way to begin a meal, with large chunks of blue crab sandwiched between two slices of avocado, topped by crisp sticks of tart green apple and drizzled with almond oil. The combination of crab and avocado is tried and true... and boring. The strongest praise Aaron could offer for this dish was to call it "inoffensive," and I tend to agree. Yes, the crab was tender, the avocado creamy, and the green apple crispy, but one can only stand so much of the sweet-tart combination of the three. Nothing explicitly wrong with this dish, yet it was far from riveting. 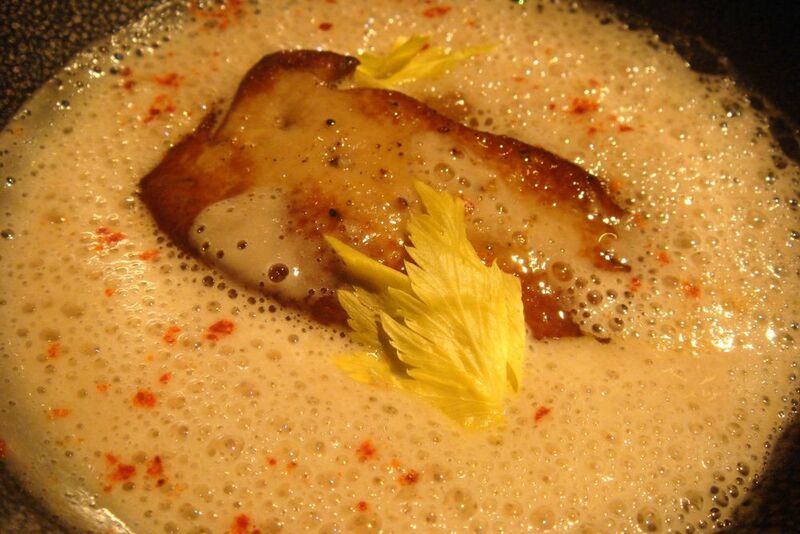 The very first dish I tried at L'Atelier was L'Oursin, sea urchin in a lobster gelée topped with cauliflower cream. Before even receiving this course, I couldn't help but stare in awe at the plating in process -- each drop of green parsley mayonnaise placed with surgical precision, perfectly matching in size and spacing, in a ring atop the bed of cauliflower cream. Unfortunately, this dish offered more style than substance as the extremely delicate flavor of the sea urchin was overwhelmed by the excessive amount of lobster gelée. Aaron was disappointed as well, pointing out that the temperature of the dish was a bit too cold, which kept some of the more subtle flavors from emerging. Another light dish is La Langoustineen carpaccio, only this one is not fried, or even cooked for that matter. Thin slices of raw langoustine were lightly garnished with roasted poppy seeds, chives, and edible flowers. Thinly sliced langoustine "carpaccio" is one of the most interesting edible textures, feeling somewhere between solid and liquid -- I am never sure if I should use a fork or spoon. Its tender texture is, however, not accompanied by a fatty mouthfeel, but is actually rather lean with a clean finish. The flavor was somewhat in-between a lobster tail and a shrimp, with an incredible softness. A scattering of poppy seeds added a textural crunch. The chives added an herbal freshness and a slight bite. I'm not too sure what the other elements did because aside from color differentiation, they weren't very noticeable. Despite its simplicity, this was a magical dish. Another interesting preparation with that same ingredient was La Langoustineen papillote croustillante, a single langoustine wrapped in paper-thin brik pastry with a single basil leaf visible inside. Served alongside this was a dab of vibrant green basil pesto. What first struck me as incredible with this dish was the apparent lack of oil. This langoustine was deep-fried; yet it neither felt, looked, or tasted the least bit greasy. Second, the crust was strikingly thin. The first dish that comes to my mind for comparison is shrimp tempura, where the batter often becomes distracting due to its thickness. But here, the brik adds nothing but a fine crisp layer contrasting against the tenderness of the langoustine. Perhaps the biggest evidence of the crust's thickness is its shatter effect, where the first bite literally showers tiny fragments of the coating onto the plate, much like the first bite of a fine croissant. A friend reports that the wrapper is now rice paper instead of brik dough, so it will be interesting to see what effect this has on the texture the next time we stop in for this treat. Neither of us were thrilled with La Coquille Saint-Jacques, a single scallop served in its shell with seaweed butter. 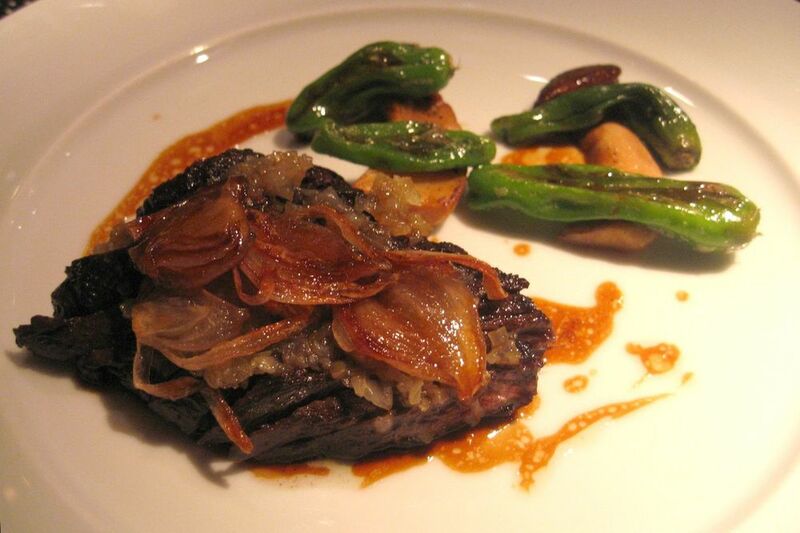 In fact, I would say this is one of the weakest dishes we've ever had at L'Atelier. With such a minimalist presentation, there is no room for error. 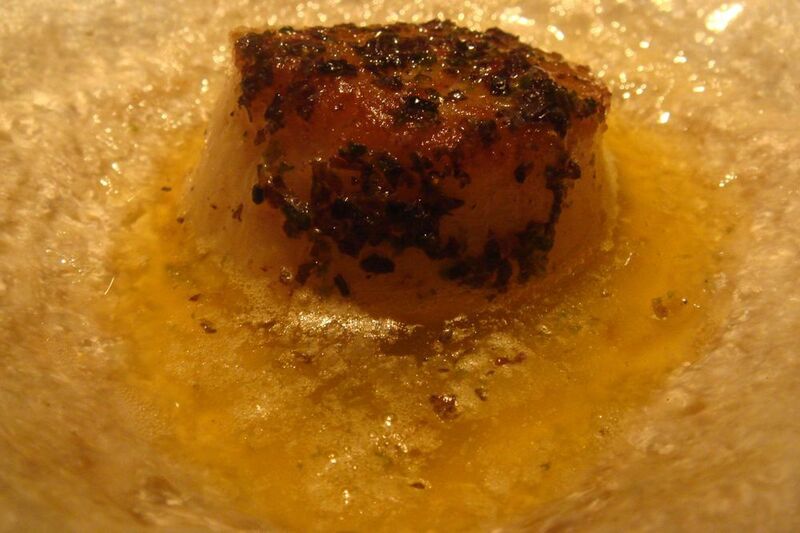 Unfortunately, every time I've stubbornly ordered this dish, I found the scallop to also be overcooked -- hard and firm. Practically floating in (admittedly very good) Échiré butter, it almost seemed more about the butter than about the scallop ("Wait... the butter dish is already on the counter," Aaron quipped when this was first set before us). The natural sweetness of both the butter and the scallop were unfortunately masked by the dried seaweed used to season on the scallop. This contrast, in most cases much appreciated, was overwhelming here. I never thought to combine scallops and truffles, or really any kind of shellfish and truffle; but as it turns out this combination works really nicely, particularly because the muted flavor of scallops are highlighted by the fragrance of the truffle -- rather than competing, these two ingredients actually enhance one another. 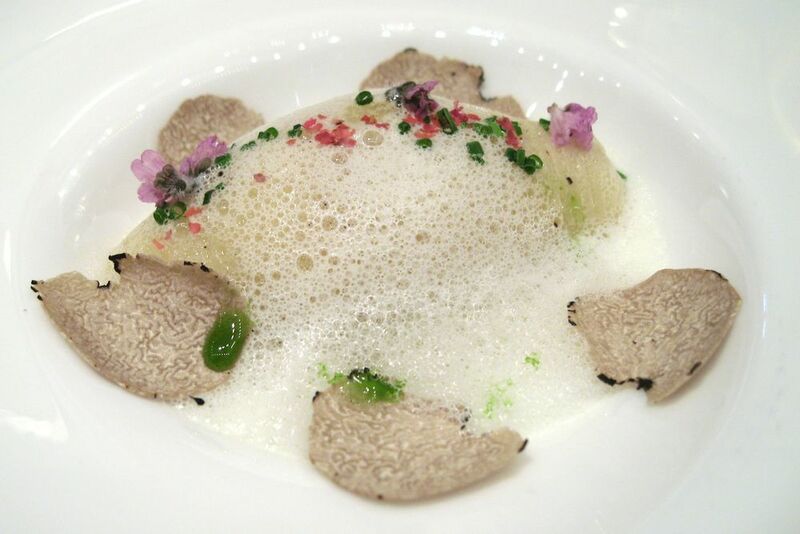 But for me, it was the milky foam that really brought La Saint Jacques en mousse together, since I don't think truffles simply grated directly on scallops would have done much more than serve as a distraction. This addition also created a scope of texture, starting from the gentle airy foam as you work your way to the slightly chewy scallop, and finishing with the crunchy accompaniments, all being accentuated with the scent of truffle. While I'm not the biggest proponent of table-side service; for truffles, the fresh shaving can really allow one to fully appreciate the aroma. But even without that extra flourish, this was fantastic. The boundary between pet and edible dinner guest always seemed to confuse me, particularly because I would eat just about anything. Rabbit? Okay. Cute little suckling pig? Why not. (Don't start this conversation with Aaron unless you want horse or dog brought up...) But frog?! I thought about the moral implications for a second minute, then my carnivorous stomach made up my mind for me and I ordered Les Cuisses de Grenouille. Too often, frog legs are unnecessarily greasy and messy to eat. But as haute French chefs are wont to do, the chefs at L'Atelier, well, frenched the bones. The resulting meat lollipop encourages the use of hands (though Aaron generally needs no such encouragement) without leaving the fingers greasy afterwards. The crispiness of the batter nicely complimented the slight chewiness of the meat, without it feeling excessively oily. The parsley coulis added some vivid color to the plate, but did nothing to save this dish from ultimately being quite boring. And honestly, those three Lilliputian frog legs look pretty pathetic all by themselves on the plate. There are certainly better options on the menu. Getting into the main fish courses, part of our very first meal included Le Bar, a sea bass filet with crispy baby leeks, tomato, and a lemongrass foam. I did not much care for this dish as I found the lemongrass foam to be a bit too strong. Also, the fried baby leeks on top were a bit dry, adding too stark a textural contrast to the warm and moist fish. Third, and perhaps most importantly, the portioning of the fish was significant enough that it actually caused palate fatigue after about the third bite. I should point out, though, that Aaron disagreed with me on this one. He found the natural sweetness of both the tomato and the leek to work well with the aroma from the lemongrass, and he was not so overwhelmed by the foam as I was. Not my favorite dish, I admit, but far from a failure. On a more recent trip to L'Atelier, I sampled L'Amadai cuit en écailles et servi sur une nage bulbe de lys, a tender filet of amadai (sea bream), served skin-side up, whose flesh gently parted with just the slightest press of the fork. 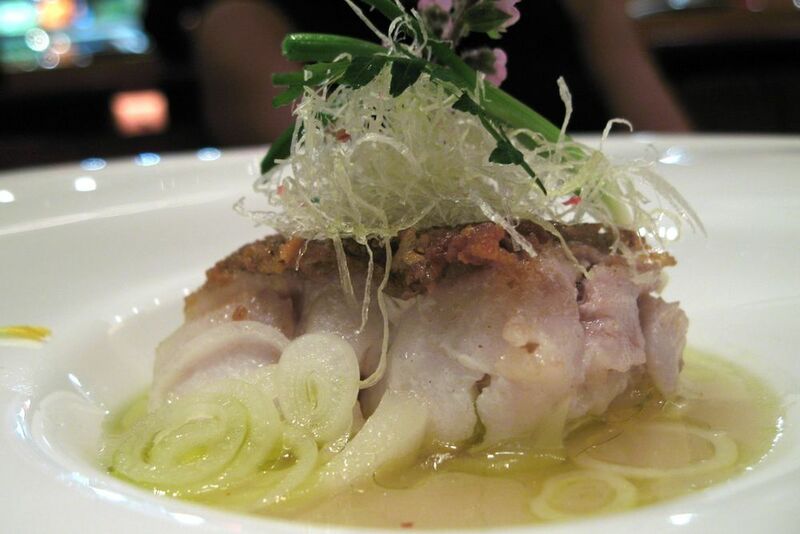 The crevices within the filet, combined with its absorbent texture, drew in the lily bulb broth making the texture of the fish moist, juicy, and redolent of lily bulb. This dish's Japanese-inspired simplicity and lightness made it a refreshing break after other richer courses. But that being said, this dish didn't particularly move me; and while the quality of ingredients was high and the technique exemplary, he'd probably hold off on ordering this to save room for other things. Aaron long believes that smoked salmon has no place at the dinner table. It's one and only companion should be a New York bagel (and maybe a schmear of cream cheese). 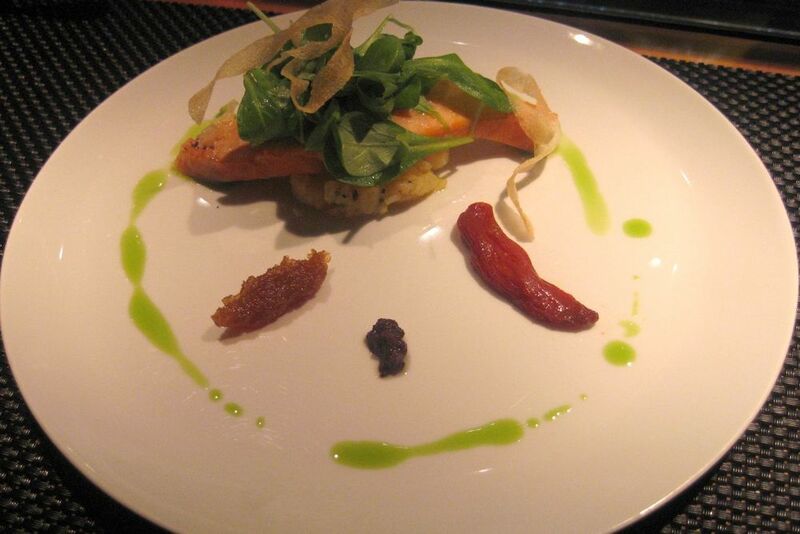 But one night, having either run out of other options on the menu, or seeking to expose the unfortunate circumstances of his birth outside the Tri-State Area, he opted to order Le Saumon Mi-Fume, the lightly smoked salmon. Laid on top of a buttery potato cake, the fish was tender and moist, if surprisingly a bit muted in flavor. The watercress brightened it up nicely, though, as did the minuscule condiments that came alongside -- a sweet onion jam, black olive paste, and a single sun-dried tomato. The fried ribbons of potato were a nice idea, but ultimately ineffective in adding a crunchy textural element to the dish. Aaron has tried on a few occasions to imprint the leaf of an herb on a piece of pasta, each time without much success. It's certainly not easy; at least, that was the first thought that ran through his head when he was presented with La Morue - fraiche en imprime d'herbes dans une nage aux aromates, a thin sheet of parsley leaf-imprinted pasta laid across the top of generous piece of cod. All of this was placed in the center of an aromatic broth. Since the fish was skinless, the sheet of pasta acted as a chewy component both making the dish more texturally interesting, and keeping the tender fish intact. It also locked in much of the moisture and heat, as the fish kept its temperature for a while. Soup, pasta, and fish course all in one, this was a pretty enjoyable dish. Another tasty presentation reminiscent of both ocean and land was Le Calamar, a salad of squid cooked a la plancha with violet artichokes, chorizo, and tomato water. Adding a nice top note was a generous distribution of piment d'Espelette, the spicy Basque pepper. With all the graceful knife strokes of a veteran sushi chef, the chef carefully scored the calamari with his knife prior to cooking, so that it puffed up and fanned out as it cooked. The effect on the texture was wonderful, with the firm, almost crunchy (but not tough) calamari cooked to just the right point. The slight smoky and spicy chorizo added richness, and the lightly dressed arugula salad on top of it all provided a bit of additional acid in addition to the naturally peppery flavor of the greens. While Aaron quite enjoyed this dish, I found the arugula in particular to be superfluous. Probably not something I would order again (though Aaron would). After a while, it seemed like we'd run out of new options on the dinner menu. When that happened, we simply asked to take a look at the lunch menu! One dish that caught me eye there was La Pintade, or guinea fowl. This dish certainly seemed more on the Spanish side rather than the French side of Basque cuisine. The bird was very moist, with the breast resting underneath the confit leg. Pimientos padrones were placed on top, the sometimes-spicy-sometimes-mild peppers that are damn good when just fried in olive oil and sprinkled with coarse sea salt.On the very top were crisp slivers of jamon serrano, and there were also bits of roasted tomato throughout. And definitely plenty of piment d'espelette -- a favorite seasoning of L'Atelier. The overall combination of ingredients was quite tasty. My only complaint was that there wasn't enough sauce to go around for the cous cous, leaving much of it dry. Other than that, this was a nice dish. 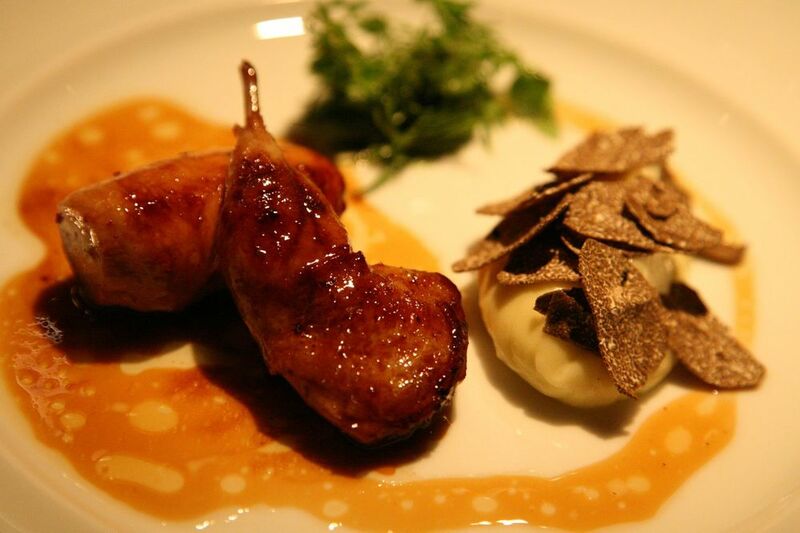 A solid choice that never seemed to leave the menu was La Caille, caramelized quail stuffed with foie gras mousse, served with potato purée covered with shaved black truffle, and a small green salad dressed with a simple vinaigrette. Though this is a dish whose richness may first strike the diner as one-dimensional, it is actually quite indicative of Joël Robuchon's attention to balance on the plate. 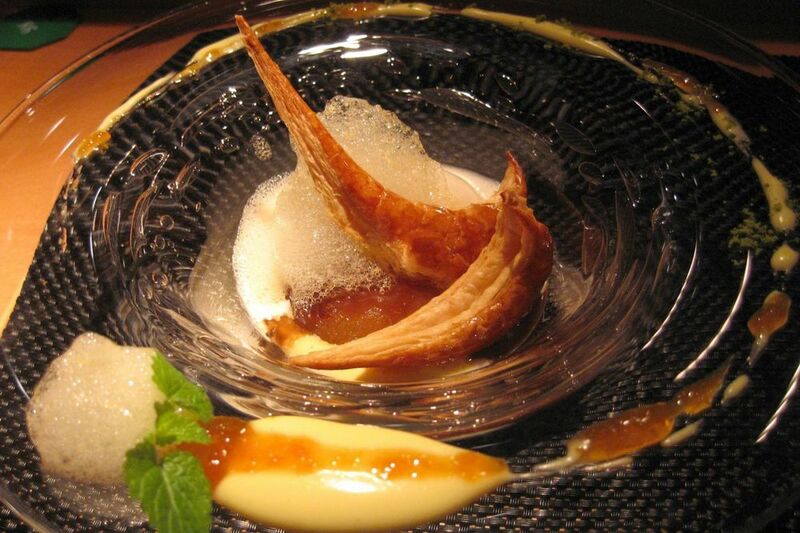 It has the complex sweet and salty, with the caramelized quail meat playing against the rich foie gras stuffed inside it. The hot and the cool, with the quail and the buttery puréed potatoes brightened up the tart green salad. 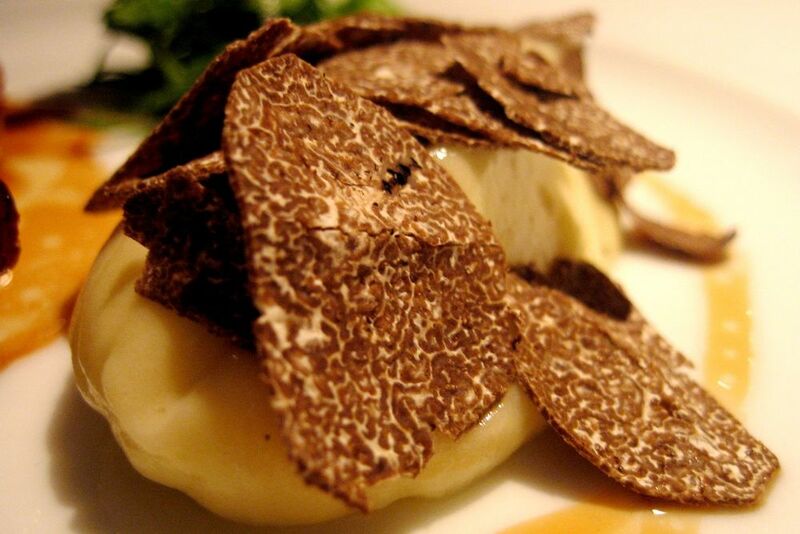 Likewise, both texture and aroma are given equal attention, with the buttery smooth puréed potatoes elevated by the unmistakable earthy aroma of truffles. No single element threatens to dominate over another, and the resulting harmony is the stuff dreams are made of. 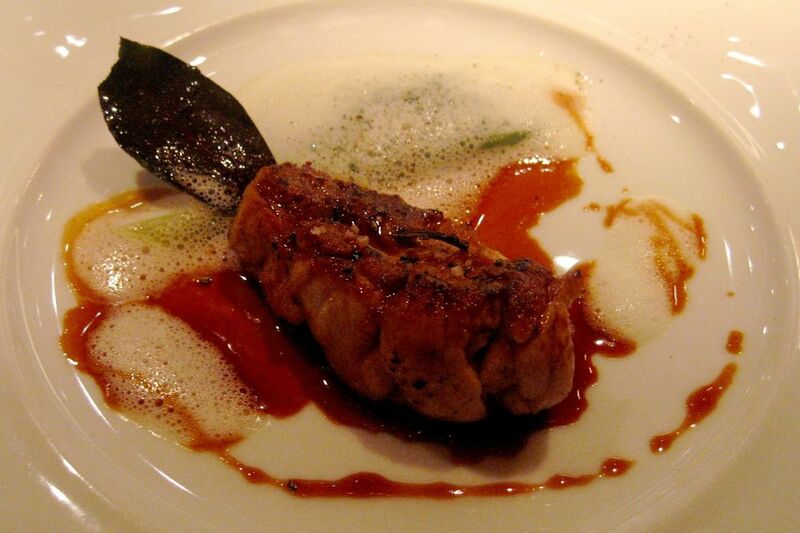 Le Ris de Veau was a nothing more than a simple preparation of sweetbreads, but a good one. The fresh laurel leaf didn't really accomplish much; but, the sweetbreads were cooked very well: crisp on the outside and buttery smooth on the inside. It's easy to tell when one has started with a good product and it has been cooked correctly, when there's none of the fatty or oily mouthfeel that poorly prepared sweetbread dishes often have.This is still very rich and meaty, but maintains a clean finish. But the dish was certainly not perfect. I mean... stuffed lettuce leaf? C'mon now.As much as chefs try to turn lettuce leaves into something special, it is rarely successful.That said, with the main ingredient being cooked impeccably well, it is hard to find much fault with this dish. After viewing the very cool Annotated Dish write up in New York Magazine, and running out of new things to try, I decided to give Le Foie Grasfumée, the layered combination of smoked foie gras and eel terrine, a try. Once was enough. The dish reads very well and sounds like a combination that would work; but it didn't. In fact, this was one of the biggest disappointments Aaron has had at L'Atelier. The glazed eel is so sweet that it completely overwhelms the foie gras. The creamy texture of the foie gras is prevented from coming through by the drastically different, almost stringy texture of the eel. The white on the plate is actually whipped cream -- what was that doing there? There was also a bit of sansyo pepper to perk things up a bit, and some chives mainly for color variation; but the real problem was the conflict between the eel and smoked foie. Aaron points out, though, that people whose palates we trust (our friend Ulterior Epicure, for example) disagree with him regarding this dish, so perhaps it is worth revisiting. One time that Aaron stopped by without me, he enjoyed a few items I have still yet to see on the menu myself. Figures... the one time I couldn't go. The first dish was Le Foie Gras de canard une symphonie soyeuse sous une fine gelée à la feuille d’or, a thin layer of veal stock gelée on top of a very creamy foie gras mousse. 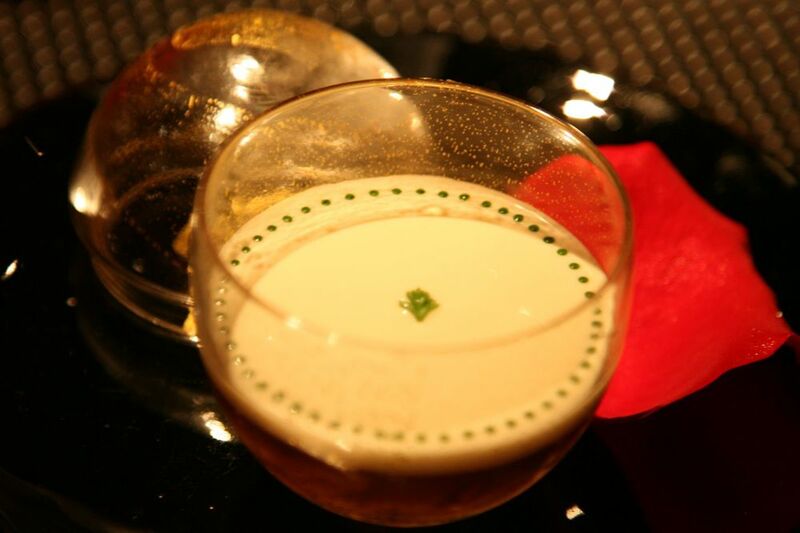 This combination was covered with shaved white truffle and edible gold leaf. The truffles gave a rich and interesting aroma to this dish that otherwise would have had essentially none. 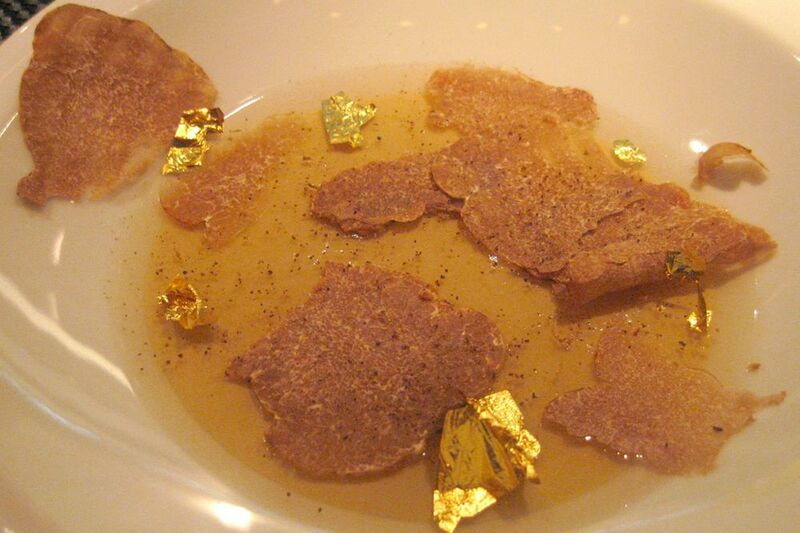 The gold leaf was, obviously, superfluous, but that minor quibble this dish as a whole was wonderful. It is always a nice to see something as rich and creamy as foie gras prepared in a way that highlights, without distracting, the ingredient's natural flavors. When I first saw Le Foie Gras chaud de canard au gratin de pamplemousse, I hesitated at the thought of mixing grapefruit, or any other kind of citrus for that matter, with something so delicate as foie gras. But since we had already had everything else on the menu out of curiosity, I went for it. I was pleasantly shocked. Somehow, the bitter acidity was muted -- but not completely -- in a way that actually cut through the fatty mouthfeel leaving behind a crisp, lean, but still creamy flavor. The sauce was left thin which allowed for maximum absorption in the liver, despite making the plating a bit runny -- a sign that flavor, in this dish, was not to be sacrificed at the expense of presentation. The saltiness of the foie gras engagingly complemented the fruitiness of the grapefruit, a beautiful twist of different flavors that mixed together in harmony. 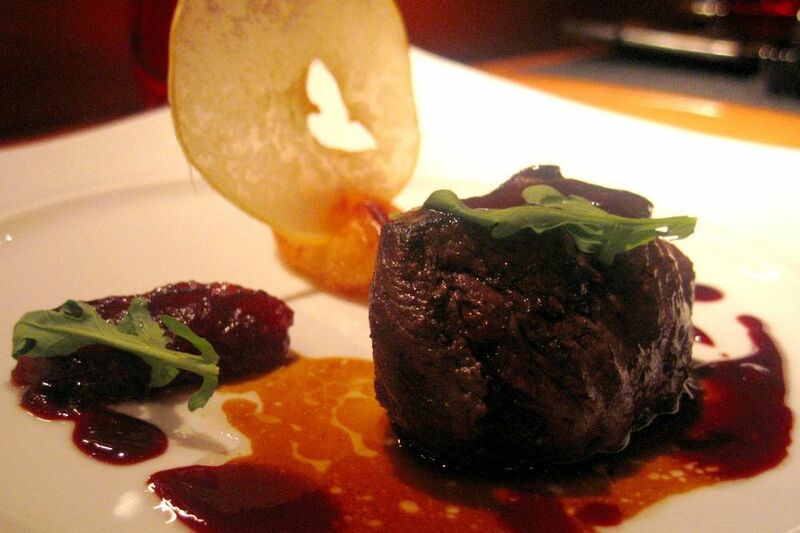 Among the meat options, Le Chevreuil, a filet of venison with caramelized quince, was perhaps the heartiest. What a nice combination. Aaron always says how annoying it is that venison is always paired with the same old black/blue/huckleberry sauce. Frankly, it's trite. Pairing it instead with caramelized quince was refreshingly original, and added just the right level of sweetness. The venison was cooked rare as venison should be. Aaron is a sucker for a well-executed aigre-doux (fancy French words for sweet-and-sour) preparation (don't get me started on the Italian cipollini in agrodolce), and so I thought the mignonette worked very nicely in this case. Overall, quite a solid dish. It's pretty rare to hear someone mention a foie gras and beef burger without bringing up Daniel's db burger. See, I just did it, too. But L'Atelier has a foie gras and beef burger on their menu as well, and it is pretty unique. 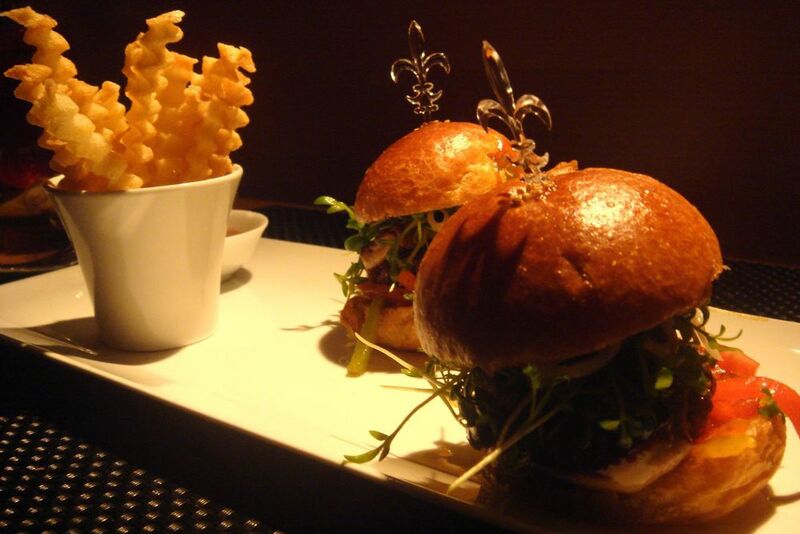 Le Burger is arguably more about the foie gras than the beef. It's incredibly juicy, making one wonder whether it's the foie gras or the ground chuck that is more responsible for the stream of juices that will inevitably run down your hand. Aaron and I both dislike bell peppers very much, and frankly their addition in this dish seemed out of place. But the small brioche buns are very nice, soft and slightly sweet. The dish also comes with a small cup of crinkle cut french fries and house-made ketchup with a very sweet and distinct flavor which comes from the addition of ginseng. Aaron and I didn't particularly like the sweet ketchup; but our friend did proclaim it the best thing since kosher Coke. Sometimes, though, the bun, the peppers, and the other condiments just get in the way. Sometimes I just want Le Boeuf. Basically about eight ounces of pure raw meat, L'Atelier's exquisite beef tartare is the best I've ever had (... in the US, I should add, lest we forget the buttuta al coltello I had in Italy). In an effort to minimize palate fatigue, we've found L'Atelier to be generally consistent with the portioning; but this dish is nearly two to three times the size of any other dish on the menu. It is definitely intense, and definitely not for vegetarians. The dish comes with just the right amount of condiments -- mustard, cornichons, red onion, and parsley -- which highlight the natural flavor of the beef without distracting. The texture of the meat was very nice, too, neither too coarse nor too finely ground. Yes, there were crinkle-cut french fries, and yes, they were tasty; but really. who cares about stupid french fries when the meat is that good? It should probably be noted that this dish's $39 price is a little steep for what it is; but certainly justifiable given the generous portion. For those who actually like their meet cooked, one surprisingly fantastic option was L'Onglet, the humble cut of hanger steak presented with shallot confit, grilled piquillo peppers and roasted fingerling potatoes. The meat was juicy and tender, and when topped with the sweet caramelized shallots and surrounded by an intensely meaty jus, the more complex salty-sweet flavor was quite enjoyable. The roasted potatoes and grilled peppers added a Basque flair to the dish, and topped with a few coarse grains of fleur de sel, they were quite flavorful. A fully satisfying main course, and a nice change of pace from the smaller tapas-style portions that permeate the majority of the menu. 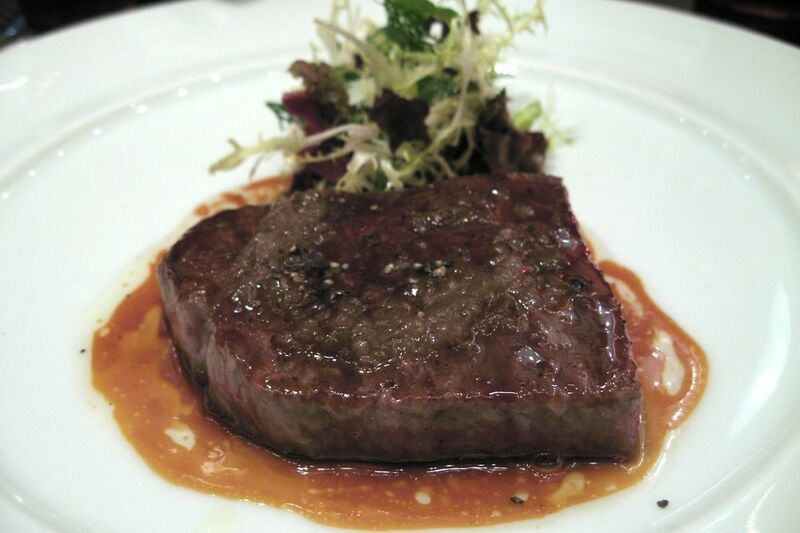 While perhaps leaner than a slab of foie gras, kobe beef is nonetheless renowned for its intensely marbelized texture. We've sampled two variations of this Japanese-style beef at L'Atelier, one served with grilled piquillo peppers and the other with wild lettuce. I found the latter less appealing, as the raw lettuce served more as a useless garnish than something to complement the steak. The contrast between raw and cooked was just too stark for the lettuce to work with this dish. That being said, he was asked how I wanted the meat cooked, without any haughty mentions of how "chef recommends" that he get it -- a small sign that the restaurant was thankfully willing to cater to the preferences of its clients. His request for rare was fulfilled, the marbelization shining through with each slice. (Truth be told, for something this fatty, Aaron and I swear by medium-rare, allowing a bit of the intramuscular fat to be rendered.) Unless shared among two people, this course became a bit tiresome, since it was, after all, simply a steak. While the quality of meat was indeed high, this seemed more applicable for a steak house and a little out of context with the creativity of some of the restaurant's other dishes. It would seem based on what we've shown so far that vegetables may be lacking in a meal at L'Atelier. Quite the contrary -- there are a few vegetable dishes that might act either as an early course or perhaps a side dish with the more substantial main courses. One such dish that seemed like a refreshing start to a meal was L'Avocat en velouté sur un fondant acidulé de légumes, a vegetarian dish not unlike gazpacho. As you can see in the photo, its presentation that is perhaps more interesting from the side. The dominant flavor in the thick, slightly gelatinous translucent base is undoubtedly tomato, though other vegetables round it out. The avocado crème layer lends some depth to the initial acidity of the vegetable base, a result that works. Texturally, we found this dish rather dull and would have liked to see perhaps some crisp vegetables to add for greater contrast. It was certainly pretty, though. A lovely vegetable dish was called, fittingly, Les Legumes, small sautéed mushrooms atop a crumbly tart crust with feta cheese, drizzled with maple syrup, and covered with crisp slivers of zucchini and yellow summer squash. Though I didn't have a chance to try this particular dish, Aaron recalls it being a lovely combination of sweet, salty, and savory. The feta and maple, in particular, was a brilliant combination of salty and sweet, and along with the mushrooms, added lovely depth and complexity to the bright taste of the barely-cooked zucchini and squash. All this talk about how wonderful L'Atelier is, and we haven't even mentioned Robuchon's famous mashed potatoes yet. Fortunately, many of the more substantial main courses often come with these as a small side dish, so you're bound to encounter them sooner or later. One small bite of these intensely buttery, unbelievably smooth potatoes, and there will be little need for anything else. In my experience, these addictive spuds have even been known to cause cases of culinary beer goggles, rendering the rest of the meal irrelevant, so enjoy at your own risk. But a meal at L'Atelier is simply not complete without a little cast-iron ramekin of these potatoes. Dessert at L'Atelier usually began with a palate cleanser titled Le Yuzu Vert, a small shot glass of green yuzu granité with a lemon verbena gelée and a thin layer of cachaça, which is the national drink of Brazil. 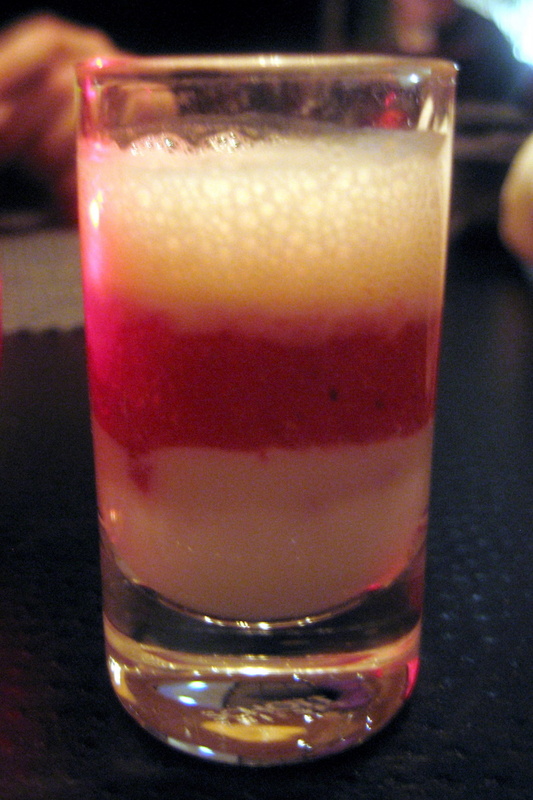 The tartness of the cachaça was moderated by the slightly herbal gelée, making the mouth-feel very fresh rather than bitter and tongue-cringing. This dish was served ice cold which further amplified its refreshing power. A larger portion of this would be overkill; but as a segue into the sweeter end of the meal, this dish does a fine job. On later visits, this was replaced by coconut ravioli with lemon-mascarpone mousse. 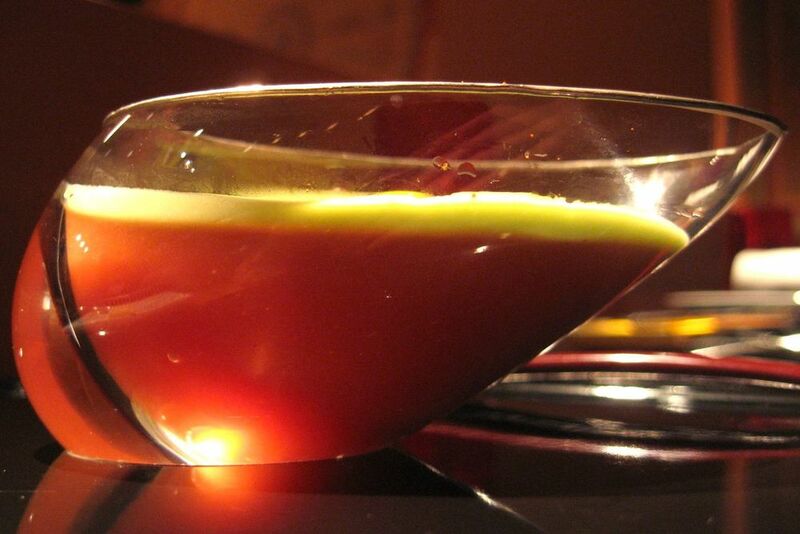 A delightfully successful result of spherification, the coconut "ravioli" bridged the gap between liquid and solid. An ultra-thin film gave way to the creamy center, making for a burst of coconut flavor on the tongue. This delicious "ravioli" stayed afloat in a pleasantly tart lemon gelée, and beneath that was a luxurious mousse of lemon and mascarpone. Truly a stunning transition to dessert, it both cleansed and reinvigorated the palate for the treats still to come. Less successful, though, was the most recent pre-dessert Aaron sampled: almond panna cotta with strawberry-tomato confit, and strawberry foam. What sounded like a tasty combination on paper was surprisingly bland and ultimately lackluster. The texture was not the problem; there was a nice progression from custard-like to light and airy. It was the overly muted flavors. Neither almond, strawberry, or tomato were really able to stand up and get noticed. Definitely not one of his favorites. 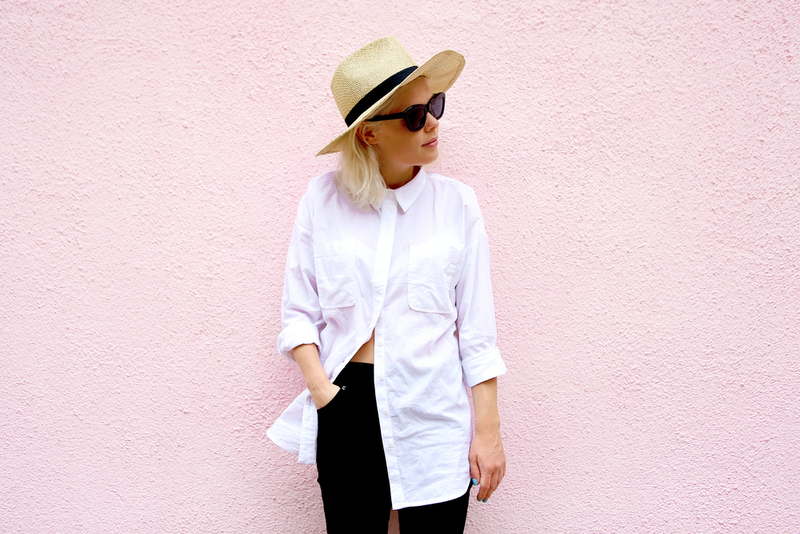 Now how can we even begin to talk about Le Sucre? It's hard to pinpoint exactly what makes this sugar sphere filled with raspberry mousse so special, since there's so much to it. Is it the perfectly spherical shape? 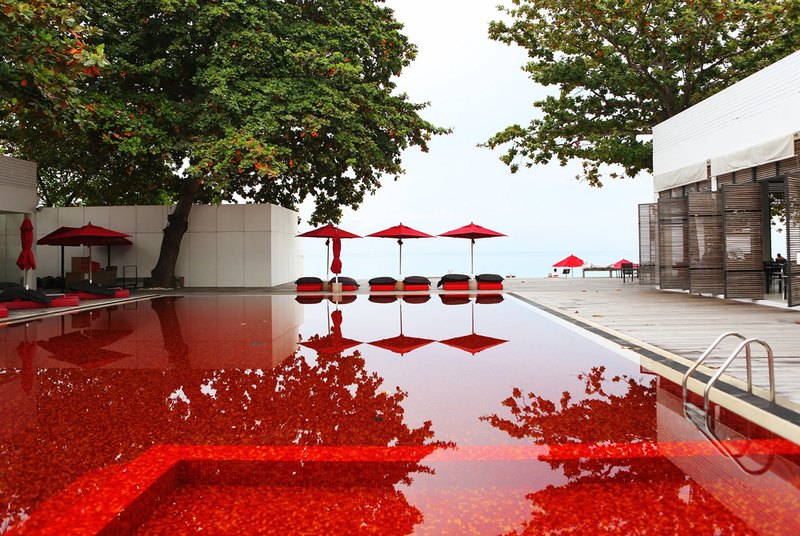 The beautiful color? The spectrum of textures and temperatures? 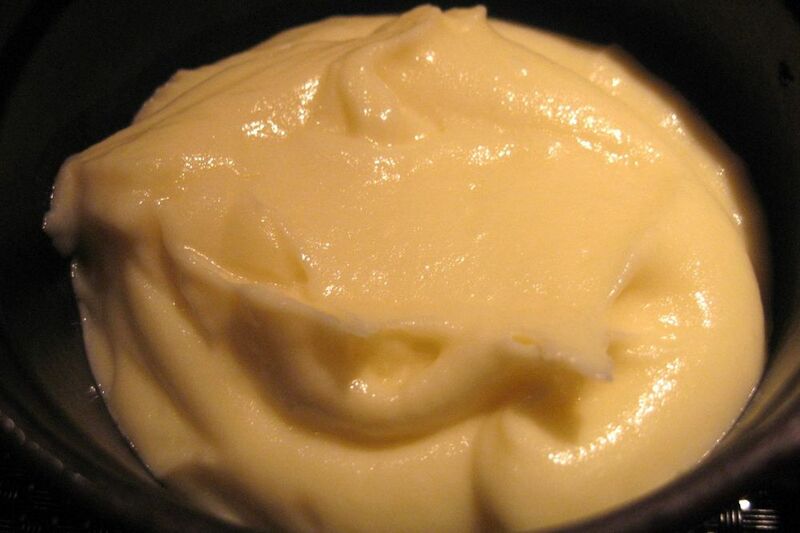 The sweet flavor of the airy mousse tamed by the gelée? The gentle cracking sensation from the first bite? Actually, it's all of the above. This is certainly an exceptional dessert. The paper-thin sugar piece is blown into a perfect sphere in a process very similar to glass blowing. 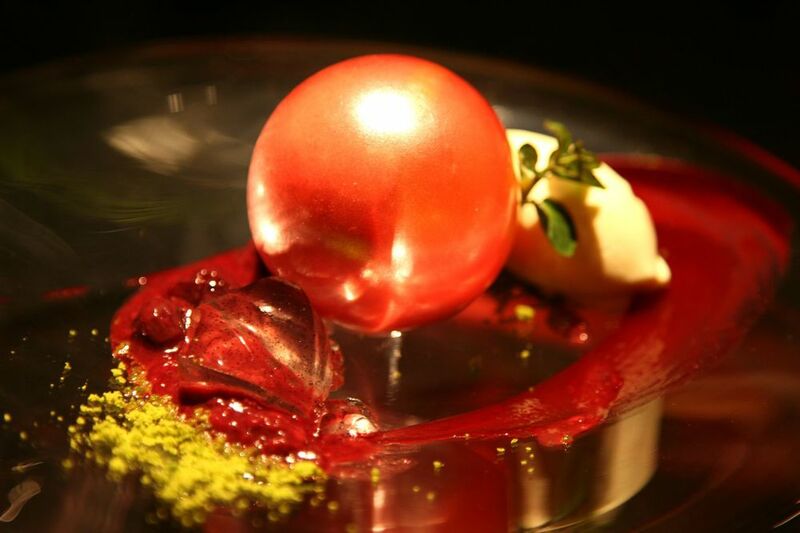 The thin sphere is then filled with a duo of ethereal fraises des bois and mascarpone mousse, set off-centered on a clear glass bowl, and garnished with a tart raspberry and blackberry coulis, pistachio dust, Kirsch gelée and vanilla ice cream. The precision of this sphere is almost alarming -- a perfectly round sphere, this is no oblate spheroid or any nonsense like that. The balance of the flavor is also impressive, with the sweetness of the mousse filling contrasting very nicely with the slightly salty pistachio dust. While Le Sucre the most interesting dessert we've ever had, there are still some others that need to be mentioned. Le Baba, for instance, includes a large piece of yeast cake soaked in rum, set atop diced pineapple infused with fresh thyme, and topped with caramel ice cream and a luscious sabayon. The strong hit of the booze and the herbal note of the fresh thyme kept this dish from being overly sweet. The baba, as always, acted as a delicious sponge as it soaked up the flavors of the other components. Certainly a very tasty combination and a nice change of pace for those who may are looking for a good non-chocolate option. Also quite nice was La Poire, an almond soufflé served outside the ramekin with poached pear and bitter almond ice cream. Granted, the fact that the soufflé was served outside of a ceramic dish should have no effect on flavor; but it certainly had an effect on temperature as this cooled down very quickly, especially with the adjacent ice cream. Additionally, one of my favorite parts of a soufflé in general is the crispy layer on the sides and bottoms where the batter sticks to the ceramic. This did not have that. That being said, this had a memorable almond flavor, and pairing it with poached pears, slightly bitter almond ice cream, and toasted almonds was a very tasty combination. Not quite so nice was a dessert simply entitled Le Soufflé, a caramel souffléthat came resting in a shallow pool of chocolate soup and bitter orange ice cream. We each took the first bite -- confusion. Then a second bite -- disappointment. There was no third bite. This was absolutely horrible. The ice cream was utterly tasteless. The caramel had been burnt, lending an exaggerated bitterness to the soufflé that was not to be tamed by the other accompaniments. The chocolate soup was like an insipid, clumpy, unstirred serving of Swiss Miss. Just a terrible dessert all-around. This remains the one and only thing we've ever sent back at L'Atelier. Fortunately, other choices offered fabulous consolation. They say the first step to recovery is to admit the problem, and I will be the first to tell you: I have a chestnut addiction. So when I saw Le Marron on the menu, I knew it would one day be mine. 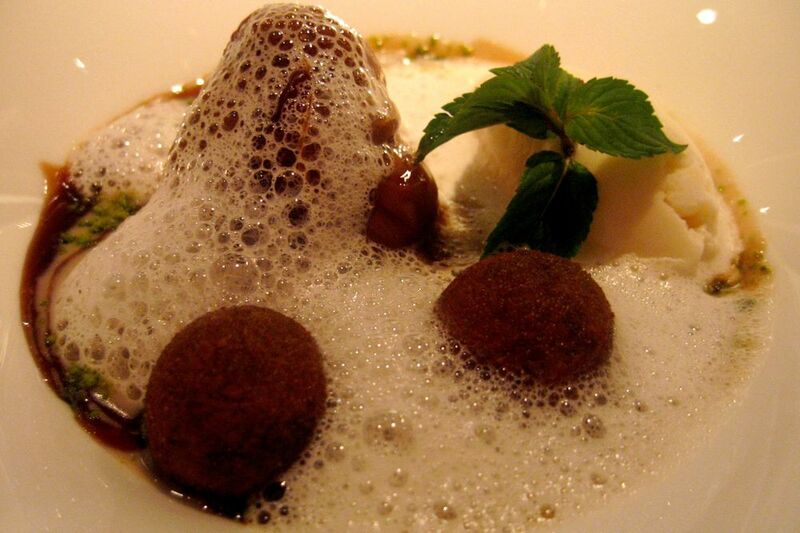 This dish consists of chestnuts with liquid chocolate-filled croquettes, dates, and a chestnut soup. The chocolate croquettes were incredible -- self-contained bursts of cocoa flavor that literally exploded in your mouth. The warm chestnut soup was delicious on its own, with a rich chocolate sauce lining the outside edge of it, allowing a bittersweet harmony in each spoonful. When I had this, the condensed milk ice cream was literally flavorless; but Aaron ensures him that this was a fluke, as every time he's had it (and there were many), the sweetness of the ice cream brightened up and carried the rich flavors of the chestnut and chocolate wonderfully. The chopped dates were also a great addition. Aside from Le Sucre, this was by far Aaron's favorite dessert, and one of his favorite dishes at L'Atelier, period. Not usually something either of us would order, a surprisingly good choice was Le Chocolat Noir, a molten chocolate cake topped with a chocolate tuile, vanilla ice cream, and served with coffee mousse and whipped cream. My first though: why the coffee?! Nobody likes the coffee jelly beans; why would anyone like the coffee mousse? I need not have worried, though, as the flavor of the mousse was very gentle and by no means offensive. My favorite part of this dish was definitely the semi-liquid chocolate in the center of the chocolate cake. The center didn't quite ooze out; but, it hung out just around the cooked/undercooked line. It wasn't too sweet, either, which was really appreciated. On my latest visit, I sampled Le Sensation Chocolat crèmeaux au chocolat guanaja, sorbet de cacao au biscuit oreo, ground oreo shell encrusting a thick chocolate mousse and covered with a ring of guanaja chocolate. With each bite, the crunchy bits of oreo weaved their way into the creamy mousse, making each spoonful interesting. The dish was actually served at room temperature, so when I cracked the ring chocolate, it actually melted rather than got in the way. This might be the darkest colored dessert I've ever had; nearly perfectly black. Yet as I ate it, he couldn't help but think of Jell-o chocolate pudding. Not such a bad thing, I suppose, but considering the apparent complexity of this dish, I doubt that's the first association the pastry chef would like to come to mind. A cool and refreshing alternative to the chocolate options was Le Pamplemousse, chilled grapefruit segments with an olive-scented gelée and and mint sorbet. Definitely on the lighter side of desserts, just in the vicinity of ordering sorbet or fresh fruit, to which my response is always "Get a real dessert!" This dish lets the bitter flavor of the grapefruit come through a bit too strongly, which I never particularly enjoy, so I probably would not get this a second time. That being said, the mint increased the cool-winter-breeze effect of this dish. Afterwards, I felt like my mouth took an ice cold shower. The olive-scented gelée was barely detectable, overwhelmed by the grapefruit's acidity. 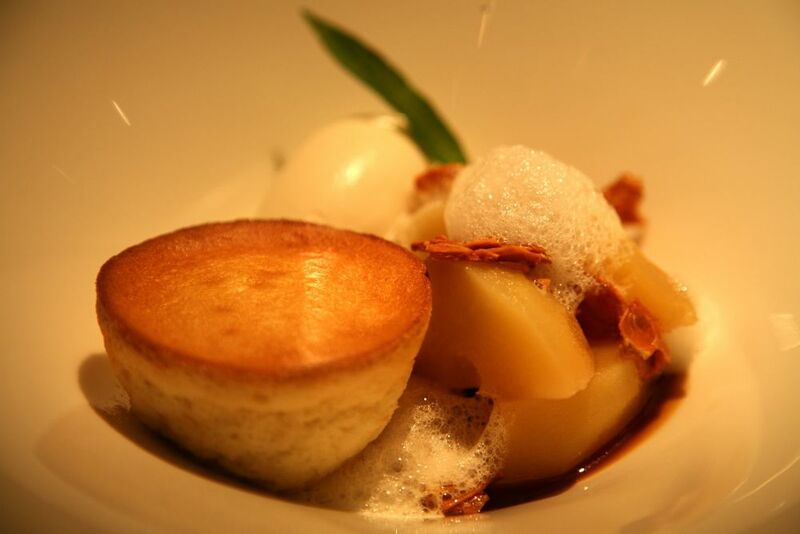 On another visit Aaron sampled Le Riz, a milky rice pudding served with caramelized apple and rosemary ice cream. This had very good potential. Unfortunately the portion was microscopic, with two tasteless strips of puff pastry making up the majority of the dish's volume. The sweet and herbal combination of caramelized apple and rosemary was a delicious one, and the rice pudding itself (an entire teaspoon's worth, no less) was very tasty. Ultimately, though, the portioning left this dish a little out of balance in his opinion. Being a slight hypocrite (see two paragraphs up), one night I just felt like having ice cream and sorbet. Les Glaces et Sorbets du Jour offered just that. There were perfect quenelles of mint and vanilla ice cream, as well as mango and grapefruit sorbet, resting on a bed of fresh blueberries and a few coarse chunks of vanilla bean gelée. The best of the bunch was probably the creamy mint flavor, with a refreshing herbal aftertaste. A thin tuile stuck in the top provided a nice textural contrast, and while essentially flavorless, a light foam atop the ice cream did make for a pretty presentation. Occasionally the gods would smile upon us in the form of a plate of cannelés at the end of a meal. These wonderful little treats from Bordeaux are as tasty as they are beautiful. Essentially small cork-sized, rum-soaked pieces of brioche, they get a wonderfully caramelized exterior from the copper pans in which they are traditionally cooked. A crisp, slightly chewy outside gives way to the boozy sponge-like inside. L'Atelier's version is certainly commendable, if not quite in the same league as Petrossian Bakery on 7th Ave. near 58th Street. Lastly, absolutely no L'Atelier experience is complete without a small plate of macarons. I'm pretty sure there has never been a time when I haven't asked for five or six more rounds a few extra of these wonderful French delicacies. Flavors we've encountered have included raspberry-mascarpone, chocolate, and lemon, each of which I consider to be the freshest and best tasting macarons available in Manhattan. Period. Aaron agrees -- there is no better place to enjoy our favorite French pastry. There are three important characteristics that I always consider, all of which L'Atelier gets right nearly every time. First is clearly the flavor. When dealing with certain varieties like citrus or chocolate, it's really easy for macarons to become cloying. There is a fine line between sweet and too sweet; and in my experience, especially with lemon and raspberry, I find them almost always too sweet. Not at L'Atelier. Second is the texture -- one of the most divine sensations is the first bite into a macaron where your teeth gently sink through meringue without any pressure. When a macaron has been sitting around for a while, the point where the crème touches the meringue become a bit soggy and get chewy -- I believe there should be no chewiness in a good macaron. Again, never a problem here -- always fresh at L'Atelier. Third, is the meringue to crème ratio -- too much of either one kills the gentle macaron, and often violates the first and/or second rules as well. I think that the ideal height of the ganache layer is around a fourth of the total height of the cookie. L'Atelier always get this right, too! Every time, these treats are such a satisfying way to cap off a meal. This makes L'Atelier a nice post-dinner destination for a second or third dessert, coffee, and a few tasty cookies. One of the many elements that makes this restaurant so strong is the portioning. Most tapas-sized portions are just enough to share; but, not nearly enough to cause palate fatigue. It's also the perfect size for ordering several dishes or, at times, just one or two and a light drink. 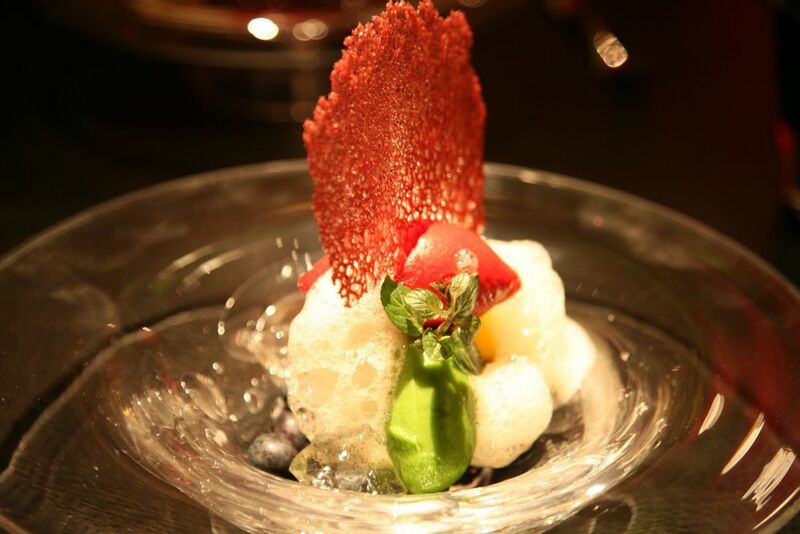 While the dishes clearly reflect the organized passion of chefs Robuchon and Suga, the experience is customizable such that it literally molded to our cravings every single time. A first-time visitor to New York might be overwhelmed by the weight of his Michelin guide. 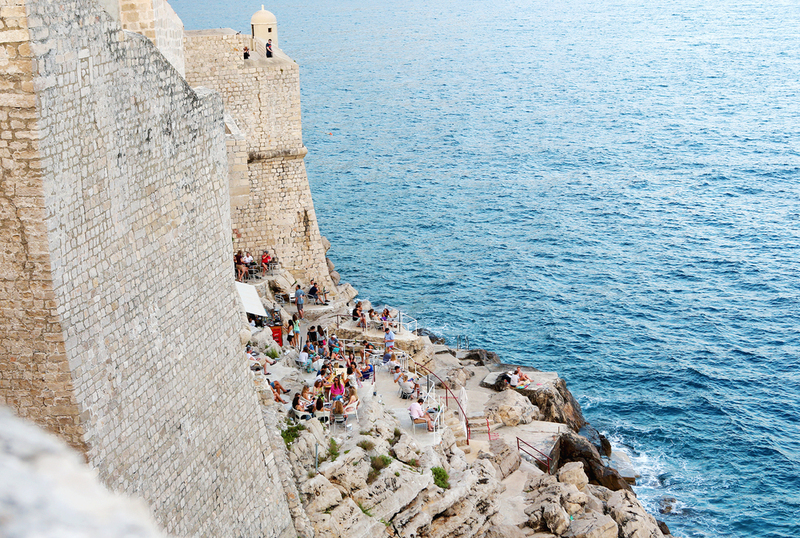 Actually, this culinary capitol is no less intimidating for its food-passionate residents. But we can say fairly strongly that if we had the chance to visit only one restaurant in this special city, it would be L'Atelier. This "workshop" has consistently provided, plate after plate, dishes that have reminded us why we love food so much. We can only hope that you have the opportunity to indulge here in the near future ... just don't forget your appetite.